IMF & Troika: a big, fat Greek divorce? IMF controversy: is austerity backfiring? In August, Greece and its European creditors, the European Central Bank and European Commission (the IMF’s ‘Troika’ partners), came to a third agreement in five years to provide an emergency financial package to Greece, worth up to €85 billion ($94 billion). The role of the IMF, which inputted into Greece’s negotiations with its European creditors, has provoked significant criticism from civil society and its own member states for undermining the negotiations by insisting that no leeway would be provided during negotiations to delay pending payments to the Fund, requiring that policies which the Greek public rejected in a June referendum would have to be implemented regardless, despite itself conceding that Greece’s debt is unsustainable. 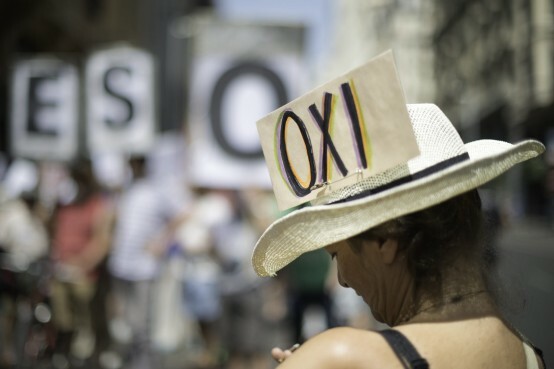 IMF in Greece: unwelcome from the start? A June 2013 internal Ex Post assessment (see Update 86) of the first Troika agreement with Greece in 2010 found that the Fund had participated in the Greece package in order to enable a “holding operation” to enable other European states to limit the fallout from the Greek crisis, in particular to their banking systems. This required that the Fund create an exception to its requirement that if lending to any member there is a high probability that the Fund will be repaid. Despite this acknowledgement the Fund advocated drastic cuts to Greek public spending. Evangelos Venizelos, Greece’s finance minister from summer 2011, described the cuts as politically, not economically, driven: “[the Troika] insisted on measures that were acts of cruelty to make us prove to them that we were prepared to pay the political cost,” he told Reuters. In June, the Greek government, which had been elected in January on a platform of renegotiating the conditions of the existing Troika agreement, announced that it had exhausted attempts to renegotiate the conditions of the package. In the same month it required all banks to close due to its financial predicament, initially for a week. While negotiations with creditors continued, limits were placed on access to cash for citizens and businesses. The government also indicated that it had insufficient financing to repay €2 billion of payments to the IMF for its 2012 loan package due in July (see Update 83) and that it would be holding a late-June referendum to seek public backing to reject the bailout conditions on offer. Though the non-repayment to the IMF was widely called a default, in reality it initiated the IMF’s arrears procedure which can eventually culminate in expulsion of a member-state from the IMF for non-repayment. Nick Dearden of UK NGO Global Justice Now! argued in an August blog that the terms of Greece’s privatisations showed that “the privatisations aren’t to do with helping Greece … it makes no sense to sell off valuable assets in the middle of Europe’s worst depression in 70 years … the vast majority of the funds raised will go back to the creditors in debt repayments, and to the recapitalisation of Greek banks”. Indeed, of the €85 billion loan, €54 billion or over 60% was earmarked to refinance existing debts, with €25 billion committed to recapitalising failing Greek banks.